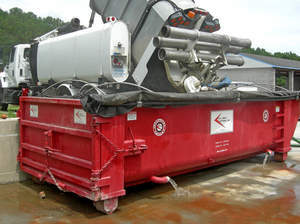 SOURCE: Flo Trend Systems, Inc.
HOUSTON, TX--(Marketwired - Jun 24, 2015) - Flo Trend Systems, Inc. and Environmental Improvements, Inc. (EI²) have entered into a manufacturing representation-partnership that will allow both entities to deliver top treatment solutions for the water and wastewater industries in Texas. This partnership will bring Flo Trend's line of technology-driven dewatering solutions to municipalities in Texas and surrounding areas. The two companies debuted the partnership agreement while exhibiting together at the Texas AWWA Texas Water 2015 conference and expo. Flo Trend, a leader in filtration, liquid/solids separation, oil/water separation and mixing, is known for such products as the Sludge Mate®, Oil Water Separator, Jet Shear and Power Pak® Filter Press. "We could not be happier to have reached this agreement," said Martin Kroesche, Chief Operating Officer at Flo Trend. "EI² represents the same energy and drive we have inserted into all of our business operations. They are highly regarded in the industry, and we will jointly strive to deliver the best products and services through them to our Texas market." "We collaborate with companies that share a vision for outstanding customer service and commitment to experienced equipment selection, application and service," said Lyle Milstead, President at EI². "Flo Trend is a leader in the dewatering industry, and this partnership will provide them with the market penetration needed to meet their full sales potential." Current clients in Texas will continue to work with their existing contacts, but the new partnership extends opportunities to additional water and wastewater customers in the market. Flo Trend offers a wide range of products to an extensive customer base in the municipal, industrial and oil and gas sectors. The company manufactures equipment for sale, maintains a rental fleet to service customers, and offers private and municipal financing programs. About this company Flo Trend Systems, Inc.